An attractive evergreen and shrubby plant with dark green foliage that is popularly grown as an indoor houseplant or outdoors, as a specimen. It can be potted or otherwise. Interiorscapers just love Dracaena deremensis! With statuesque beauty, great tolerance for low light conditions and resistant to diseases, they make excellent plants for indoor decor. Outdoors, being robust shrubs that thrive on neglect, landscapers love to use these tropical beauties extensively. Like Cordyline terminalis (Ti Plant), Dracaena deremensis are seen to beautify every nook and corner, so to speak. Count us in too! We’ve been growing Dracaena deremensis for decades! But have yet to nail the identity of this garden variety in spite of having researched much to do this article! It’s such a hardy, dependable and fuss-free plant, making it such a delight to have. Moreover, its ability to rid the air of pollutants does impress us so! Etymology: Dracaena comes from the Greek ‘drakaina’, meaning female dragon, referring to the resinous red gum that exudes from cut stems, when thickened, is supposed to resemble dragon’s blood in European legends. Origin: Dracaena deremensis is a native of Tropical Africa and Asia. Features: Dracaena deremensis is one of the approximately 40 species of the genus Dracaena, and has many cultivars and sports. These tropical evergreen and woody perennial plants are widely grown for their ornamental foliage and majestic beauty. Leaves come in all shapes, broadly ovate, strap- or lance-shaped and in varying sizes, broad and short, long and slender. Blade colour can be solid green or variegated with white or yellow longitudinal stripes or margins. 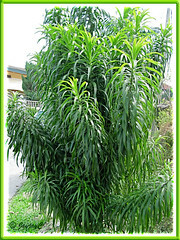 Growth habit is mostly columnar and upright, ranging between 2.4-3.6 m in height but can be trained to be a small and bushy tree by regular pruning. Some cultivars do produce flowers with sweet fragrance, hence attributed to its accepted botanical name, Dracaena fragrans. 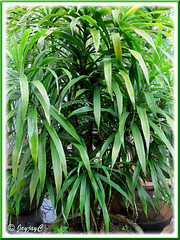 The very popular and dramatic Dracaena fragrans ‘Massangeana’ (Corn Plant Dracaena) with its central yellow variegation on its green foliage is one such plant. 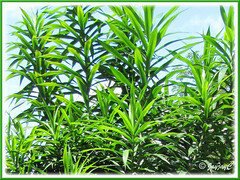 Dracaena deremensis, a NOID variety or hybrid of unknown parentage – this popular garden variety in our country, Malaysia, has solid dark green foliage. Lance-shaped blades are smooth and simple, slender and arching, about 15-30 cm long. It looks somewhat similar to Dracaena ‘Janet Craig’ except the later has much broader leaves that are glossier too. They are spirally arranged on unbranched stems that eventually become top-heavy with rosettes as the lower leaves wither. Foliage appears dense as the internodes are very close. Hence, when their rangy stems are hard pruned or trimmed selectively at staggered heights, they’d create an impressive and bushy specimen plant for the garden. Similar to other varieties and cultivars, it has an erect and upright growth habit with clumping stems or multi-trunked. Generally, it grows to about 2.4m tall with a spread of 1m. Nevertheless, this particular one reacts well to hard pruning and are usually seen in bush or tree form. Does it flower? We’re unsure…never seen them bloom before! 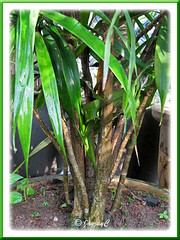 Culture (Care): The robust Dracaena deremensis, a low maintenance plant, is so easy to grow. Light: Ideally, bright light indoors and semi-shade or filtered sunlight outdoors. Avoid direct sun that may bleach the foliage. Tolerates low-light to shade, but growth will be a tad slower. Moisture: Low water requirements. However, water thoroughly when soil surface looks dry, keeping it evenly moist. At lower temperatures, water sparingly and allow soil surface to dry slightly between watering, otherwise over watering in cool environments can result in leaf loss. It enjoys humid conditions, so mist the plant regularly with tepid water to prevent brown tips and yellow edges caused by dry air. Soil: Prefers organic and well-drained soil with good aeration and water-holding capacity. Nonetheless, adaptable to a wide variety of soil types. Others: Hardly needs fertilizing, though you can feed monthly with a liquid houseplant fertilizer if you wish. Keep foliage dust free by regularly wiping them with a clean, soft cloth. Remove discoloured leaves to keep tidy by pulling downwards off the stem. Tip burn is a sign of insufficient watering, too low humidity, fluoride toxicity or high soluble salts. It tolerates severe pruning well and the severed stem can be cut into shorter 10-cm lengths and used for propagation. If plants become leggy, cut back stem to within 10 cm from base to rejuvenate the plant and promote bushiness as new growth will develop from the cut section. Or trim back leggy stems at staggered levels for aesthetic results. However, best to cut back when the stems are not too old as older, woody ones that are pruned may not always produce new shoots or growth is slowed down considerably. Repot only when plant becomes root-bound. 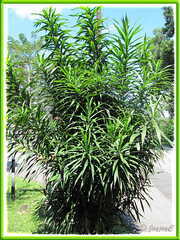 Dracaenas are generally free from pests, but do check occasionally for aphids, scales and spider mites. For subtropical regions: Hardiness: USDA Zone 10B-11. In winter, water sparingly and stop fertilizing, but resume in spring. It likes moderate to warm conditions with minimum temperature of 13°C. Propagation: By tip cuttings or stem cuttings, the easier and faster method. It can also be propagated by air layering. Usage: Excellent houseplant for homes and greenhouses or as interiorscape plant for commercial offices, hotels and malls. Ideal in containers or above-ground planter, or ground-grown in garden beds/borders as focal point in mixed plantings. Perfect landscape plant anywhere! Use it as an accent or single specimen, or use the bushier cultivars as hedges or screen. 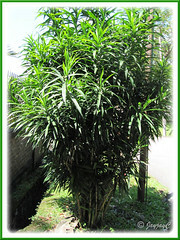 Last but not least, use Dracaena deremensis to purify or cleanse the air. It is a well-know fact that Dracaenas are some of the plants used in the NASA Clean Air Study that has shown to help remove benzene, formaldehyde and trichloroethylene. Check the list of air filtering plants at Wikipedia. ‘Janet Craig’ (Dracaena ‘Janet Craig’) – broad and arching, deep green and glossy leaves, and produces strongly fragrant white flowers; A sport of ‘Warneckii’, it was named for the daughter of nurseryman Robert Craig. 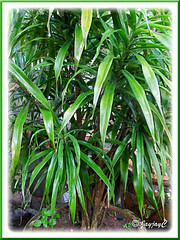 ‘Lisa’ (Dracaena Lisa, Dracaena Lisa Cane) – deep green foliage, long slender leaves and has a full bouquet look. This trademarked plant is proprietary to California and Hawaii Foliage Growers, whose owner named it after his daughter, Lisa. ‘Michiko’ (Michiko Cane) – medium-sized, deep green and thick glossy leaves that are slightly curled with foliage held tightly to its trunks. 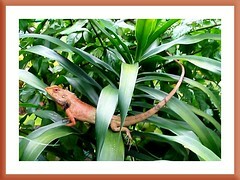 It was created by California and Hawaii Foliage Growers Inc, in Hawaii. 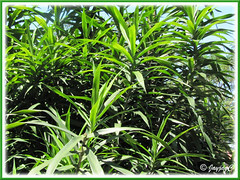 P/S: A word of thanks to Mark Akiyama of California Hawaii Foliage Growers Inc, who kindly notified us that our photos of Dracaena deremensis as seen above is not the cultivar ‘Lisa’ as incorrectly identified. Our plants could be a variety of D. deremensis or D. reflexa… we’ll assumed it to be the former until someone can wise us up positively with proper references. Do post a comment if you know its exact identity. Dieffenbachia bowmannii Carriere: a floriferous beauty! if you are looking for more information on USDA plant hardiness zones, there is a detailed and interactive USDA plant hardiness zone map at http://www.plantmaps.com/usda_hardiness_zone_map.php which allow you to locate your USDA zone based on zipcode or city. Great post, so much useful information. And you’re right, interiorscapers do love Dracaenas! They’re so gorgeous! I have managed to get a cutting of this type but a varigated white stripped from a gardener. Im guessing its known as Song of India. Wonder if both of them are the same type. Would like to wish you & your family a wonderful Prosperous Chinese New Year! And may the Lion of Judah roars and scatter all your enemies to the far corners from dwelling place. Pete – thanks. We’re sure temperate gardeners would find your link useful. Liza – thanks for the thumbs up…we appreciate you kind comments. James – thanks a bunch for the CNY wishes…so sweet of you! Hehe…had to do a Google search for Song of India to know what’s it! That’s a lovely variegated one, much more compact than Dracaena Lisa, which I’ve often seen but didn’t know its name. Wish you success in propagating the cutting. You might have the answer to my year old question! My friend gave me a tree last year, it’s doing well, I love it….but what is it???? My dad calls it a corn plant. But I’ve looked at dozens of pics on Google and that doesn’t seem right. I took pics of my plant and emailed a horticulturist. He identified it as Janet Craig….but that also doesn’t seem right. Mine has very stiff poky leaves, the edge would probably cut you if you rubbed it. Pictures of Janet Craig always show graceful, cascading, softer looking leaves. Mine also has a woody stem and one website said that JC stem stay green. Could mine be a Lisa? I would really love to email you the pictures if you could please take the time to help me. Thank you for this informative article! Maybe my mystery is coming to a close! Hi Jennifer! Frankly, we’re not botanists or horticulturists, just simple folks who’re passionate about gardening, plants and the like. Most of our plants were identified based on gardening books or photos online and may not be 100% correct. Even now, we’re doubtful whether D. deremensis ‘Lisa’ as named in our article above is correct as we’ve been informed recently that it is not ‘Lisa’. Hence, we can only suggest that you redirect your enquiry to California Hawaii Foliage Growers who specialize in Dracaenas, to confirm whether your plant is ‘Lisa’. Incidentally, you mentioned that your plant has very stiff poky leaves… could it be a yucca species, I wonder?